I sorted through recipes for cakes, tarts, truffles, puddings, and mousses before settling on a tried-and-true chocolate decadence for this holiday: Chocolate Bark with Pistachios & Dried Cherries. I could kvell about chocolate all day long (the darker, the better! ), so trust me when I say that this recipe is truly amazing. Consisting of only three ingredients- semisweet chocolate, pistachios, and dried cherries- this chocolate bark rivals the highest quality brand chocolate. Also, its chock-full of antioxidants, so I'll give you plenty of reasons to feel guilt-free for eating it! Because I'm not gonna lie, its really hard to stop. *I need to note that I did not use the orange zest. I'm not a huge fan or orange and chocolate, but if you are, I'd say go for it! 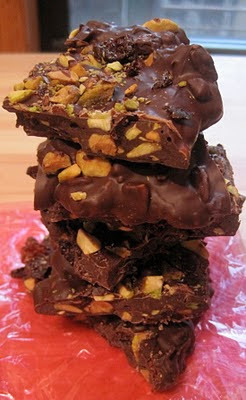 However, the pistachios and dried cherries provide enough flavor to enhance the chocolate on their own. Also, I microwaved the chocolate, so don't worry if you don't have a double broiler. Antioxidants promote cell health by inhibiting the free radicals created by oxidation. Free radicals are unstable oxygen molecules that are associated with cancer, heart disease and aging. Pistachios are considered an "antioxidant powerhouse", and the anthocyanin-derived red color in cherries has been linked to anti-inflammatory and anti-aging properties. One square of dark chocolate (over 70% cocoa) contains twice as many polyphenols-molecules that slow the growth of cancer cells and limit angiogensis- as a glass of red wine, and almost as much as one cup of green tea. "Cherries: Antoxidants." Choose Cherries. Web. 12 Feb. 2011. <ttp://www.choosecherries.com/health/antioxidants.aspx>. "Pistachio Health: Naturally Nutritious." Pistachio Health. Web. 12 Feb. 2011. <http://www.pistachiohealth.com/consumer/heart-health>. Servan-Schreiber, David. Anticancer: A New Way of Life. New York: Viking Penguin, 2009. 140-41. Print. Those chocolate barks look so delicious Rachel. Thanks for sharing. Wonderful bark....I love the mix of pistachios and cherries...so tasty. What a lovely dessert. Chocolate is always welcomed! !